Hi, friends! It's a beautiful day here in New York, strangely warm and sunny for December. What's it like where you live? Today we're going to be doing some trash talk, because it's been a really long time since I've done an Empties post (five months, actually). I use up products faster than I can talk about them, especially since a lot of these are samples I get from subscription boxes (mostly Birchbox). I'm actually quite backlogged! In fact, I'm still talking about products I used up at school (I graduated in May, to put things in perspective). The included photos were taken in less-than-stellar conditions without the help of my fancy new DSLR camera, but we'll make do! But enough about that--let's talk trash (about products, not people)! 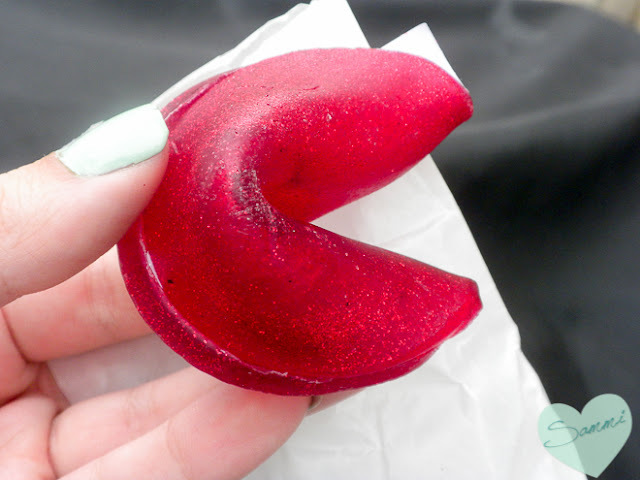 This look fortune-cookie shaped soap came in my "Witch, Please" Fortune Cookie Soap Box last fall. Like most little bar soaps, it didn't last too long, but it lasted longer than I expected. It smells like cinnamon apples, and it's really cute to look at. This scent is no longer available, but they release something similar every fall. I'm not really a bar soap person (I prefer soaps and shower gels that come out of a squeeze bottle or a pump for convenience's sake), but I would totally buy this if it came in liquid form! I feel like if I were ever at a place financially where I could justify spending $20 for a bottle of shaving cream, I'm ding pretty alright. 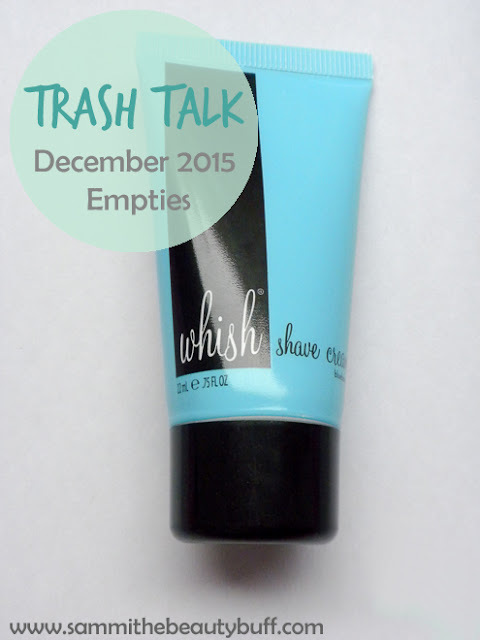 I received this sample from a Birchbox months back, and it only lasted a few uses (if even that). For awhile, I used to use Skintimate Shave Gel, which you could get for $3 at the drugstore, and now I just use whatever conditioner I have on hand that I wasn't a fan of for my hair. I'm just not that picky when it comes to shaving cream, and being a girl who likes her legs to be silky and smooth, I go through it pretty quickly. It smelled kind of like Dum Dum blueberry lollipops, which was okay, but neither the scent nor the formula were worth the price tag. I'll stick with my drugstore products. I reviewed the Modere Beauty Box about a year ago, but I don't use a lot of products in my hair, so it takes me awhile to get through them. I really enjoyed this hair serum! This is just the sample, but since I only used a bit after each shower (even though my hair is long), it lasted a relatively long time for being only 5ml. 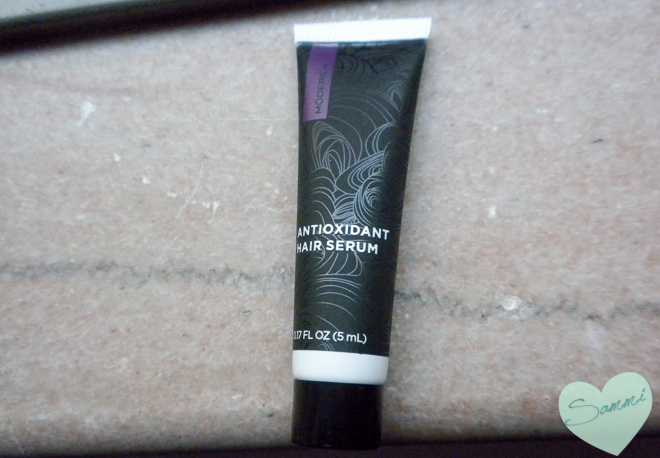 I liked the idea of incorporating antioxidants into a hair serum, since our bodies can always use more vitamins. This provided light hydration to my hair without weighing it down, and since my hair is straight, that can sometimes be a problem. I would buy the full-size, and as it turns out, I have one in my stash! I raved about this undereye concealer for months in favorites posts. I liked how brightening it was, and the texture the perfect consistency for under the eyes. It wasn't too thick and creamy that it would cake up or exacerbate fine lines, but it wasn't so thin that it was ineffective. 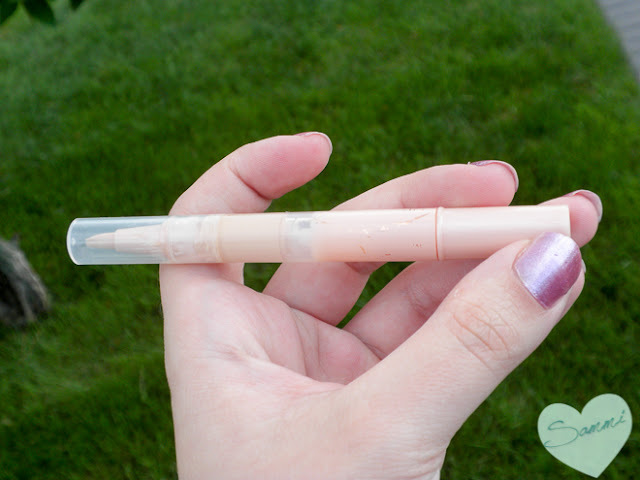 It you have dark, blue circles under your eyes, I would suggest using something like a peachy-toned corrector first, but this is good when you want light coverage for everyday. I would repurchase this, but I'm something of a beauty product nomad, so I rarely stick to something even if I like it! I'm always trying new things! I think I would have liked this product if I Birchbox had sent me the Fair to Light shade, which is closer to my skin tone. Still, even though I was cutting this with my daytime moisturizer to match it t my skin better, the coverage wasn't bad! I imagine this would be something closer to a foundation if I were to wear it alone. 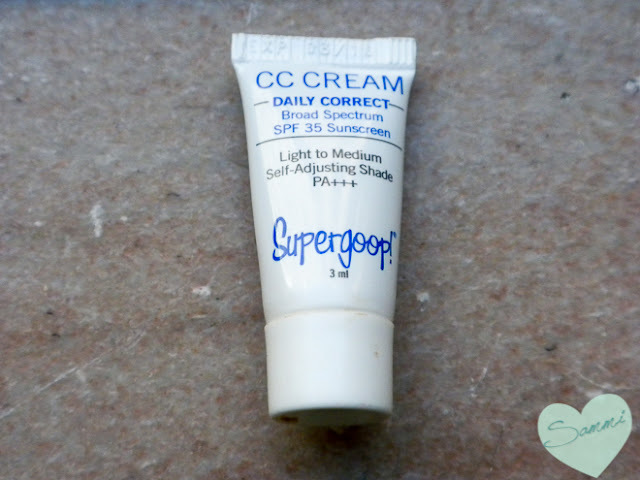 Supergoop is a sunscreen product expert, so I'm happy they formulated their CC Cream with broad spectrum sun protection. I typically don't like my makeup to have an SPF rating of 30 or more, since it can cause white-cast in flash photography, but this is good if you're not going someplace where there will be a lot of photos taken! This was part of a birthday gift from a friend so I feel bad slamming it, but it wasn't the best. 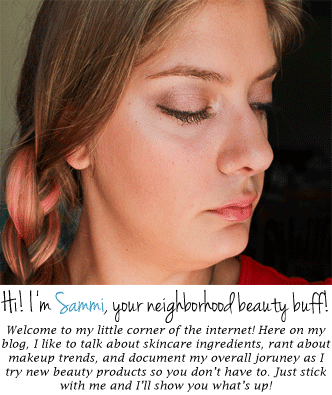 It's a pretty cheap product by a company that doesn't really do beauty products, so it shouldn't be much of a surprise, but I figured it deserved a fair chance. My skin can get quite dry, especially in the winter, so I'm always chasing after hydrating products. I liked the idea that this was supposed to be a moisturizing mask, so it confused me to see that this was a primarily kaolin (clay) mask. Clay masks are typically used to draw oil out of the skin, so why is it in a mask whose purpose is to put hydration back in? 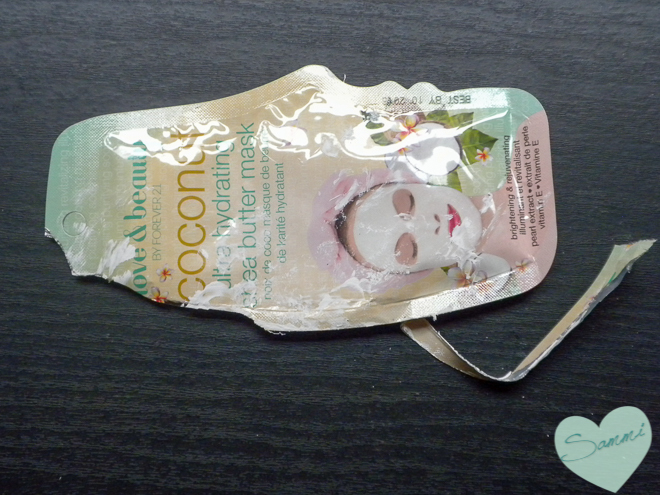 Also, for a coconut mask, I had a hard time finding the coconut. As in, there is no coconut in the ingredients list, and it doesn't even smell like coconuts! Also, for some reason this contains titanium dioxide (active ingredient in some sunscreens). I wouldn't go outside with this on my face! Needless to say, I think I'll go to Sephora or something next time I want to pick up a face mask. This Vitamin C face serum is widely talked about in the beauty community, but frankly I can't see why. Perhaps my skin is too young to get the full benefits of this product, but I just saw it as a overpriced, sticky serum that contained too much fragrance. My face is sensitive and can sometimes get red and splotchy when I use products with irritating ingredients or lots of fragrance, so this is one that my face didn't like. 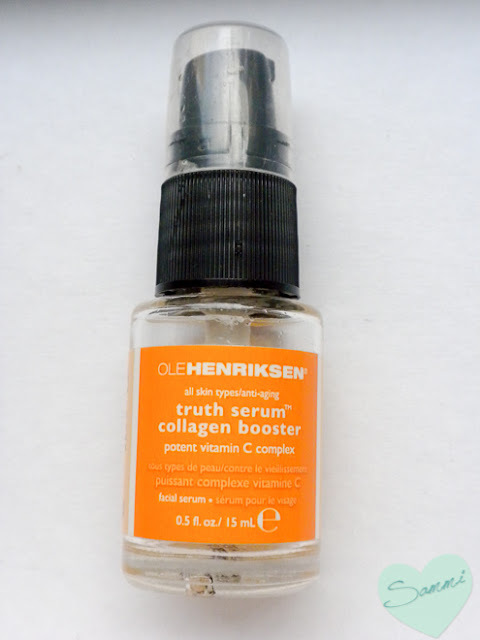 There are other Vitamin C products out there that do a better job, but I won't be repurchasing this. A lot of people are avid fans of it, though. If you're one of them, tell me why! 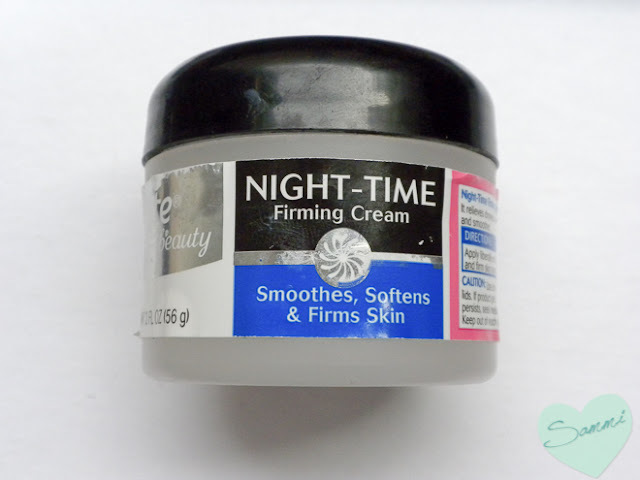 The Olay Night of Olay Firming Cream was my go-to for a few years. One time when I ran out, I wound up trying Walmart's generic version of it instead. I thought generic drugstore versions of beauty products were often identical, but I could see a big difference between this and the Olay one! For one, this one is much more highly-fragranced. I couldn't stand how flowery it smelled--just by unscrewed the lid, the smell kind of invaded my nose. It was actually an "Un-favorite" one month. It's been about a year and a half since I used this up, half of that time being a neck and chest cream, just so I didn't have to smell it on my face. Since then, I've been reading up on how jar packaging allows air and light into the product, making the beneficial ingredients break down and become ineffective quicker. I try to use products that come packaged in a tube or pump (preferably air-tight) nowadays, so neither this or the Olay has made the cut! Want to see more trash talks?